British composer Michael Finnissy was born in 1946. His work deserves to be better known than it is. Significantly, the relevance and import of his work extend way beyond the reflections on, and reactions to, areas of personal and political significance where it often has its origins. 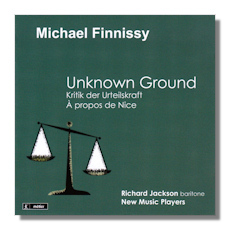 Of particular interest are the sorts of juxtaposed and apparently disjunct textures and motifs that are likely to strike the listener on this welcome new CD from Metier by the New Music Players with baritone Richard Jackson on Unknown Ground [tr.2] itself. To the uneducated ear the music here may sound challenging. But substitute "exciting" or "bright", "fresh" and "determined" for "difficult" and it really ought to stimulate productive responses – chiefly because of the composer's integrity and entirely transparent imagination. But also because Finnissy has both such a clear sense of direction and architecture; and of course has the technical prowess to fulfill the promise of his conceptions. The first and longest work on this CD, Kritik der Urteilskraft [tr.1] starts slowly and progresses without ever picking up speed – as such. Yet it is redolent of the work of Morton Feldman in the energy and momentum which Finnissy doesn't so much inject into its completely planned peregrinations, as appear to draw out of them. It's a response to Kant, of course; and scored for just five musicians. The evident obsession is as restrained as it is intriguing… instruments perform extraordinary feats – like the protracted clarinet drone at the start; these contrast with the prominent piano and the shifting in and out of focus of the small sub-ensembles simultaneously to create and suggest textures that convey far more than you might imagine from the scoring. The players, however, never stray towards undue virtuosity for its own sake. The musicians' individual and collective techniques emphatically contribute to what makes this CD so easy to recommend. Unknown Ground [tr.2] is perhaps a weaker piece than the other two here: the seven texts, for all their expert articulation (Jackson by and large avoids the temptation to declaim), are in places prosaic, mundane even. Sensitive listeners will, though, respond to the restraint in this uncompromising song-cycle that makes the impact of at times naïvely rhetorical material all the greater; though to some the profanity and jargon-laden content in places may be off-putting. The passion, sense of anger and distress are never laid on too thickly. Risks are taken; but one's overall impression is that the performers' control re-enforces the result. A propos de Nice [tr.3] is the most upbeat and liveliest of the three works. Again, its scoring is spare and intensely-pointed. Again, variety, true development, a sense of purposes and even humor abound – in some of the dissonant tunings toward its beginning, for instance. The string players are again to the fore; in fact, it's a piece for piano trio only, though its tone is richer. Their lines, tempi and control of the forms are exemplary. They never feel they have to make a case which Finnissy hasn't made in his writing. No undue bombast or turgidity. It's a strange scoring for a silent film. Hence the somewhat staccato construction. Yet it works. Like the other two pieces here in their different ways, A propos de Nice is hauntingly optimistic. The CD's three acoustics (different for each of the pieces) are all appropriately dry and concentrated. Their closeness directs our attention to their substance, not to the act of performance. Good: instrumental color and timbre are important to Finnissy. And these recordings (actually from almost ten years ago, although this is a new release) convey that focus. The booklet – perhaps in keeping with the personal tinge which informs much of Finnissy's work – is based around a short series of personal reflections by British composer, admirer of Finnissy's work, and Artistic Director of the New Music Players, Ed Hughes. The notes include the texts of Unknown Ground. If you're new to Finnissy's work and world, this will be a profitable place to start. If you're already enthusiastic, then the musicianship on the hour-and-ten-minute-long CD, is only likely to redouble your enthusiasm.